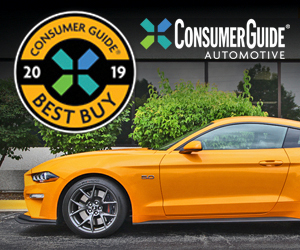 In the course of 25 years at Consumer Guide, I’ve sampled a staggering number of cars and trucks. One subset of that considerable group consists of hot, new things that were, in their times, expected to stand the motoring world on its ear. When you’re driving something like that you know it. It doesn’t take long to pick up on the curiosity of other drivers or pedestrians who may be getting their first look at something they might not even have heard about before. You see the craned necks; you hear the “Hey, what is that?” catcalls; you are invited into impromptu chats through open windows while snaking along in traffic. 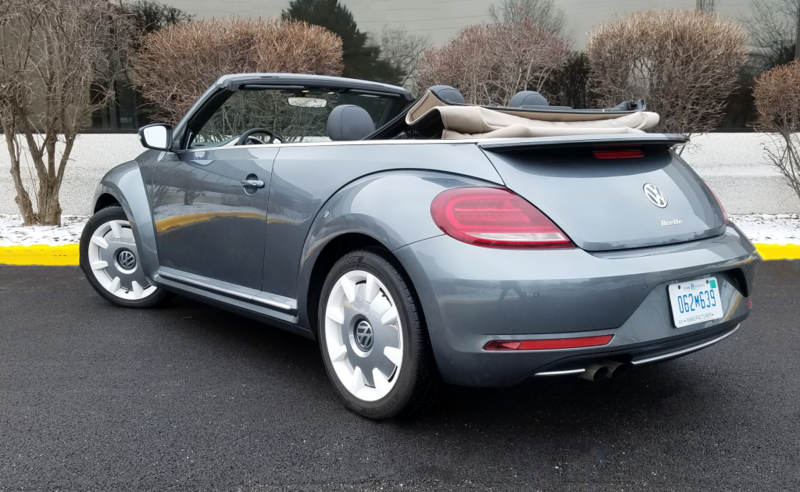 The snow and chilly temps during our test session unfortunately precluded much top-down driving, but the Beetle Convertible’s jaunty look is apparent. Trunk space is extremely limited, and the small lid makes it a bit hard to access. Because such instances are rare, memories of them bob like buoys on the vast sea of test vehicles. The champion attention-getter I drove in that quarter century was the 1997 Plymouth Prowler retro hot rod. A close second was the Volkswagen New Beetle. 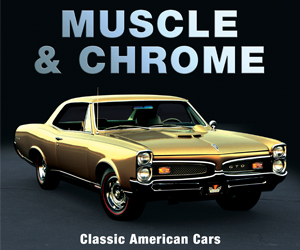 When it came out for 1998, it spurred memories of long-gone air-cooled “Bugs” within middle-aged drivers and stirred the imaginations of younger motorists, some of whom might not have been born when U.S. sales of the original rear-engine type ended. In 2012 VW updated the Beetle (now minus the “New”) with a profile that was less “fun with shapes” art project and more representative of the revered ancestor. It gave the car a new lease on life that is, at last, at its end. 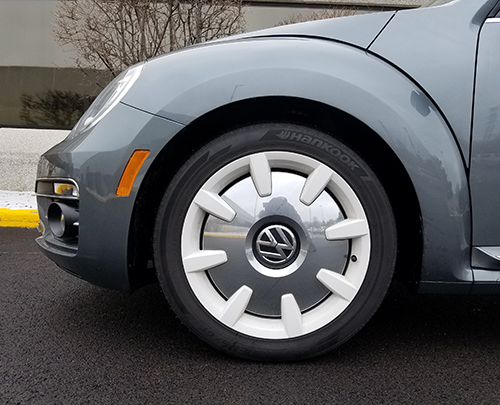 The Platinum Grey Metallic finish of our test vehicle is one of five colors available on Final Edition Beetles. The others are Safari Uni, Stonewashed Blue Metallic (both of these are exclusive to the FE), Pure White, and Deep Black Pearl. Volkswagen is Bugging out on its winsome coupe and convertible at the end of the 2019 model year. In preparation, the lineup has been trimmed to S, SE, and SEL models in both body styles, but to mark the passing, there are “Final Edition” versions of the SE and SEL. Indeed, SELs like the convertible that Consumer Guide tested only come in Final Edition trim. Diamond-pleated upholstery inserts in Pepper Beige added flair to our test vehicle’s interior. Final Editions are available in a choice of five paint colors, but two of them—Stonewashed Blue Metallic and tan Safari Uni—are exclusive to the commemoratives. In the case of convertibles, certain color combinations of top fabric and paint are only found on Finals; the pairing of Beige top over Platinum Gray Metallic body on CG’s test car was one of these. Other distinctions are specific seat designs and enhanced complements of standard equipment. The SEL boasts leather seats with a diamond-stitched pattern on the cushions and seat backs, LED taillights, Bi-Xenon headlights with LED daytime running lights, 18-inch white alloy wheels, and a 6.3-inch touchscreen navigation system. 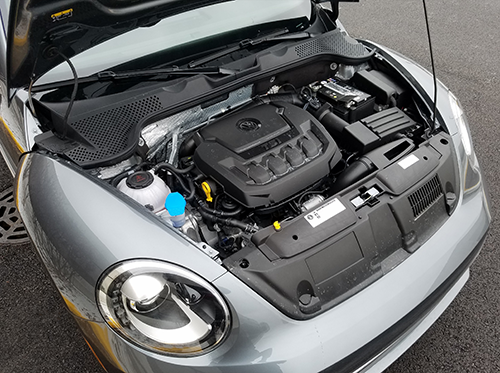 The Beetle’s 174-hp turbocharged 2.0-liter 4-cylinder delivers appropriately peppy acceleration that is in keeping with the car’s “slightly sporty” vibe. Other significant standard items are a rear spoiler, body-color heated power side mirrors, rain-sensing windshield wipers, heated windshield-washer nozzles, and automatic headlights. Interior highlights run to dual-zone automatic climate control, leather-wrapped steering wheel and gearshift knob, heated front seats, auto-dimming rearview mirror, keyless entry and starting, Safari Uni-painted dash pad, gloss-black center-console surface, and 3-color ambient lighting. Included safety and convenience technologies are parking sensors, cruise control, blind-spot monitor, rear cross-traffic alert, Fender premium audio system with CD player and satellite radio, SD memory-card reader, USB port, Bluetooth phone and audio-streaming capability, and Volkswagen Car-Net telematics. 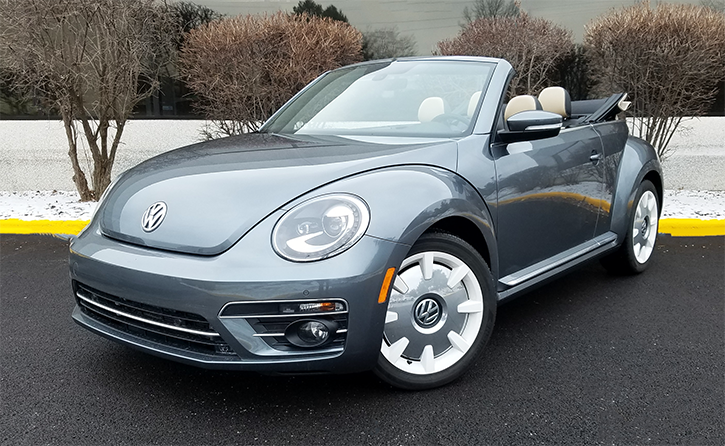 Motivation comes from the turbocharged 174-horsepower 2.0-liter 4-cylinder engine and 6-speed Tiptronic automatic transmission that became the Beetle powerteam in 2018. With commendable throttle response and a maximum 184 lb-ft of torque that’s reached at a low 1500 rpm, the engine provides decent go off the line and easily keeps up with highway traffic. 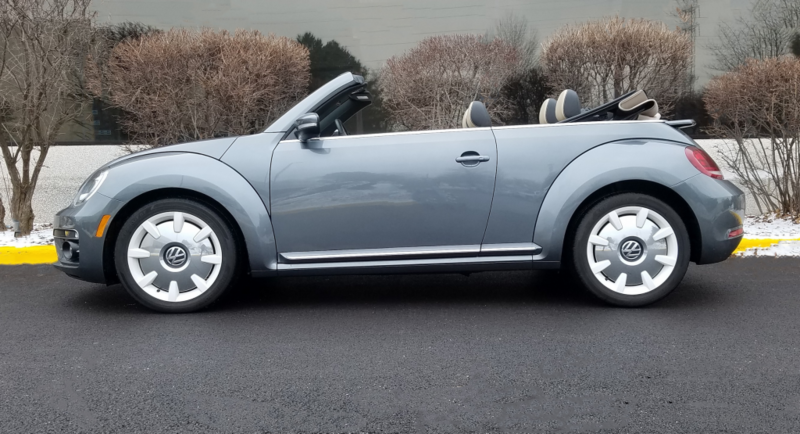 The transmission kicks down promptly, and shifts can, in the estimation of one of our editors, border on being a bit “jerky.” As for fuel economy, the EPA estimates the Beetle will attain 26 mpg in the city, 33 mpg in highway operation, and 29 combined. When this reviewer put 212 miles on the car, 55 percent of which was in city-type driving, he recorded a sound 31.6 mpg. There’s a nice blend of ride and handling qualities from the compliant fully independent suspension and variable-assist electromechanical power steering. 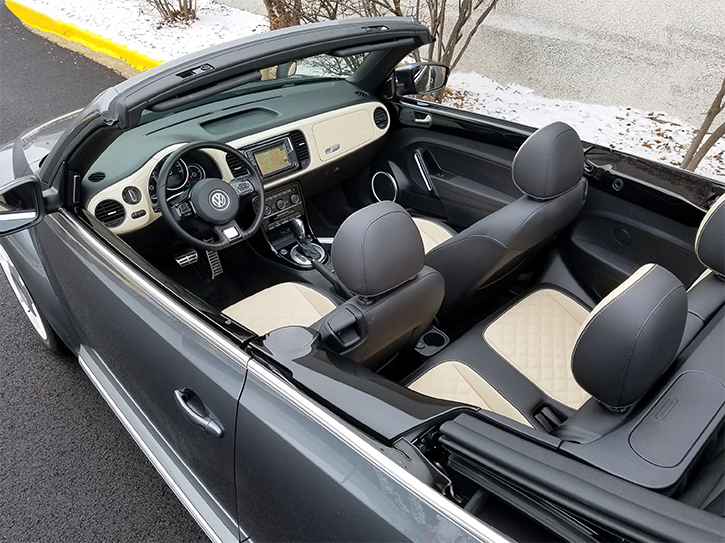 The convertible body stoutly resists flexing and rattles, and with the top up (the only way we could drive it in Chicago’s not-spring-yet weather), the Beetle soft top does an impressive job of filtering out traffic noise. Final Edition SEL models come standard with 18-inch white alloy wheels with polished centers–a slick “new-wave retro” touch. Comfortable front seats provide good support, but the rear seat backs are too upright for long-distance comfort. Rear legroom is in short supply, especially if front passengers need to stretch out. Top-up headroom is good in front but is definitely limited to sub-6-footers in back. With the top erected, drivers face a considerable obstruction to over-the-shoulder vision. Though the SEL Final Edition’s seat coverings (available in all black or black and beige) class things up a bit, cabin materials display more hard plastic than soft-touch surfaces. As for controls, audio inputs are made simply and intuitively, helpful dials set temperature and fan speed (with buttons for other climate functions), and there’s 1-step operation of the power-folding top. Cabin storage options are abundant, just not bountiful. A retro upper Käferfach glove box and a conventional lower box are helpful considering that there’s no cubby in the center console. A little covered space is in the armrest. A small open bin at the front of the console, door pockets, and pouches on the back of the front seats round out storage capability. Twin cup holders in the console serve front-seat occupants, but there’s just one for the rear row. A scant 7.1 cubic feet of cargo space is available in the trunk—maybe enough for a couple pieces of soft-sided luggage. Rear 50/50-split seats fold for added cargo space, but they don’t fall flat, and they rest at a level above the trunk floor. The starting price for the Final Edition SEL convertible is $29,995, not counting delivery or options. It’s the way to get the most Beetle possible before it becomes impossible to get any kind of Beetle. Yes, it’s time to say farewell to the Volkswagen Beetle. The swan-song models get a fairly standard send-off in the form of specially trimmed Final Edition models on both the coupe and convertible body styles. Written by: The Daily Drive staff on April 15, 2019.on April 18, 2019.